Councilman Woody Harris, left, speaks as fellow Council member Doris White listens to Harris tell fellow members Emporia should not pay a $15,000 fee incurred when a legal opinion was sought without Council consent. 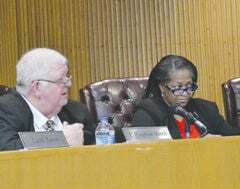 When City Council narrowly passed a motion by Woody Harris, 4-3, to not approve all of the minutes from its previous meeting, it signaled the effort of some to have Marva Dunn removed from the school board may not have yet run its course. After the return from closed session, Carol Mercer switched her vote to approve the minutes. Harris cited an expected bill to the City of approximately $15,000 from the law firm of Troutman & Sanders when making his motion earlier. Council members Dale Temple and Jim Saunders voted for Harris’ motion. Clifton Threat, Yolanda Hines, Doris White and later, Mercer voted against the motion. The issue came up again when Harris put a motion in play that would prohibit individuals from the City spending money without oversight. Hines asked if the vote could be put off until another meeting after Council Clerk Tessie Wilkins had a chance to look into the matter. Harris said he had no problem delaying a vote on the measure until the next council meeting or until other members had an opportunity to look over what Wilkins brought back to them. No action was taken Tuesday. In February an effort to have Dunn removed form the school board was rejected with only Hines voting to take the issue to circuit court to have Dunn removed and Threat abstaining. The issue surfaced when it was discovered Dunn should not have been serving on the School Board while at the same time serving on the Board of Zoning and Appeals and Emporia Redevelopment and Housing Authority. According to City statutes she could not serve on the other boards while serving on the School Board. Dunn resigned from the other two boards and remains a member of the Greensville County School Board, a position she has been serving for more than four years. During the February meeting Saunders said the advice of Troutman & Sanders, an outside attorney, was sought and $15,000 had already been spent on outside council, even though the City has its own attorney in Butler Barrett. Harris agreed with Saunders during the meeting and said needless legal bills were run up due to a personal vendetta Person had against Dunn because she ran against her in the last election for mayor. Harris said the legal bills are excessive. Person said she was not the only representative to meet with Troutman & Sanders. During Tuesday’s public comment session Debra Brown said city code was violated four years ago when Dunn was first appointed to the school board and violated once again when Dunn was reappointed in December. Brown said it is wrong to make the mayor pay the legal bill and called it a vendetta. Brown said she has called the Commonwealth Attorney and will take it all the way to the state’s attorney general if she must. Melvin Hines also rose to voice his opposition to the City not paying the legal fees incurred. Harris’ motion to prohibit individuals from the City spending money without oversight could be voted on by Council as early as April 16.